We have introduced you many aluminum products before, and today the writer will introduce you the 6000 5-bar aluminum tread plate. The thickness of the 6000 5-bar aluminum tread plate is 0.3 mm-10 mm, the width is 500 mm-1,500 mm, and the length is 500 mm-6,000 mm. It is made from the 6061 alloy, and it is a kind of aluminum tread plate which can be forged with cold treatment and can be used in situation which have high demand in anti-corrosion and oxidation. This series has many pattern such as finger, 2 bars, 3 bars, 5 bars and diamond bars. 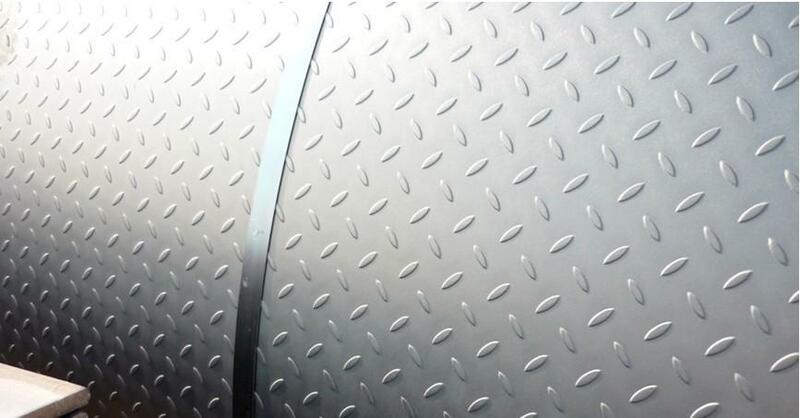 The 6061 series aluminum tread plate has a wide application, for example, this series aluminum tread plate can be used in processing airplane parts, camera parts, couples, ship parts, hardware, electronic accessories and joints, valves and valve parts, etc. It can also be used in low tension weapons and connectors in airplane. You can use aluminum checkered sheets in the floor of automobile, airplane, light rail, vehicle steps, stair treads, elevators, etc. You also can use checkered sheets in your garage or workshop for a variety of purposes. The 6000 5-bar aluminum tread plate manufactured by Haomei is of high quality, and Haomei Industrial Co., Ltd. has been engaged in the industry for almost 30 years, it gained much experiences in this fields, the aluminum product manufactured by it has been sent to the clients all over the world, if you have any demand, you can contact us, and we will supply you the best quality product and the good services. ← Want to find the best 3004 aluminum coil supplier?